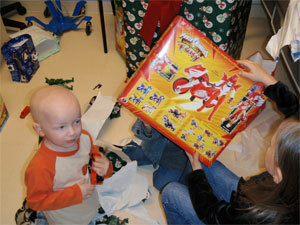 Every year the Northlake Chiropractic adopts a family in need to help make their Christmas a little brighter. Please take time to help us collect gifts of food, toys, gift cards and clothing for this years Christmas family. We have been enjoying this wondering giving experience since 2007 and hope to continue it for many many more years to come. We can do it without the help and generosity of our amazing patient family we have here at Northlake Chiropractic, thank you everyone! 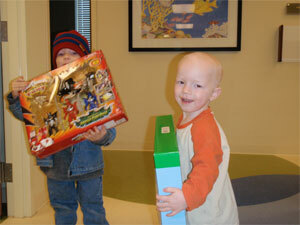 "I first met Bubba and his family when he was diagnosed with childhood cancer in April 2008. Although this family received the diagnosis every parent fears, they took it in stride and set forth to cure their little boy. Mom Shannon would bring him to every appointment with the other children in tow, while dad Daniel worked at his job in construction. 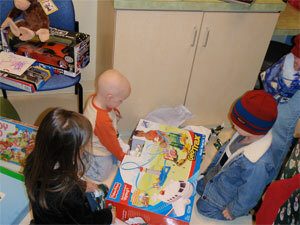 A loving hug and lots of kisses from mom would get Bubba through the difficult sticks and pokes of chemotherapy. With a 90+ mile round-trip drive (sometimes three days a week) and gas prices out of control, mom never complained. Although their means are meager, Bubba's parents never asked for anything - they just remained kind and gentle always thanking us for what we do. Unfortunately, dad Daniel lost his job in the past weeks. No complaints by the parents - mom Shannon says the good Lord will take care of them just as He has taken care of their Bubba - "It will be alright." 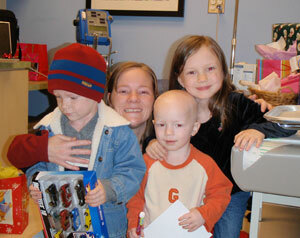 Please help us to make their Holiday season a bit brighter by considering this deserving and gracious family." Well did we ever! The following photos can't possibly display the gratitude this family felt when they discovered what we had planned for them in the exam room. 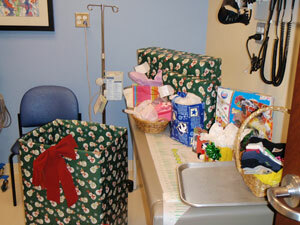 The children were beside themselves and the mother was overwhelmed with joy and thanks when they turned the corner and entered an exam room filled with toys and gifts. We received huge hugs from all of them. And it's because of your generosity that we were able to turn a stressful hospital visit right before Christmas into a time of laughs, smiles, and tears of joy! To us, this best defines the true meaning of Christmas.